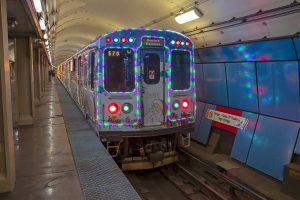 Do you and your family enjoy riding CTA’s Holiday Train, but not the crowds or the standing-room-only experience? The members of the Illinois Railway Museum invite you to join them as they tour CTA’s rapid transit system. Each ticketed rider will have a seat for the entire trip. Each trip is planned to travel to the City’s North, South, and West Sides, as well as downtown, with different lines to be covered on the two trips. Departures: 11:00 am and 5:00 pm from the Marion auxiliary entrance to the Harlem/Lake Green Line station, Marion St. and North Blvd., Oak Park. Free parking is available in the Holley Court Garage (Harlem Ave. north of Lake St.) and Lake & Forest Garage (Forest Ave. north of Lake St.), as well as free parking at meters along Lake St., Forest Ave., and Marion St. Private lots near station are generally not free. Fare: $30 per person per trip, or $55 per person for both trips (in advance). Orders received after December 14th will be held for pickup at Harlem/Lake. If any tickets remain on the day of the trip, the fare will be $35.00 per trip. No refunds after December 14, 2018. The trips will conclude at Harlem/Lake about 3:00 pm and 9:00 pm, respectively. CTA trains are wheelchair accessible; consult CTA for station accessibility. 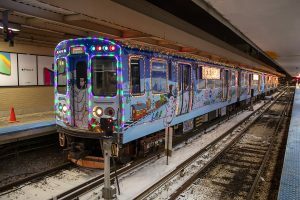 Although we expect to use the six-car Holiday Train (no flatcar or sleigh), specific equipment cannot be guaranteed and is subject to change by the CTA. This excursion is a fundraiser to support preservation and restoration of IRM’s rapid transit collection.